As shops in the Hildreds shopping centre in Skegness celebrate bucking the national trend over the festive period, with an average rise in takings of 20 per cent, some readers have been feeling a little nostalgic. Photographs posted on the Best of Skegness and Lincolnshire Facebook page, taken before the original buildings were demolished to make way for the shopping centre, sparked a number of comments from people who remember those days. 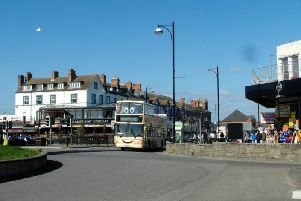 The site dates back to 1811 when the former Hildreds Hotel was known as the New Inn. It changed its name when Joseph and Sarah Hildred took it over in 1828, when it was still surrounded by pasture land owned by the Earl of Scarbrough. Following her husband’s death, the inn was run by Sarah Hildred, until 1873, when it was renamed the Hildreds Hotel. In 1987, it was demolished to build the Hildreds Shopping Centre. Steve Andrews, manager of the shopping centre, said: “The Hildreds Centre has many features that mimic the hotel, like the small gable above the window on the front. The Hildreds Centre now has 30 shops - with announcements soon about two new ones taking the vacant units. The first event at Easter will have the theme ‘Tiger Came for Tea’ and celebrate the 50th anniversary of the book as well as raising funds for Nigel the Puma, who is going blind and needs sensory accomodation at the Lincolnshire Wildlife Park.